Two millennia ago the whole of northwestern Italy was inhabited by the Liguris, the people from whom the region of Liguria gets its name. Today, this northwestern region of Italy is home to seaside resort towns often compared to Cannes and Monaco. 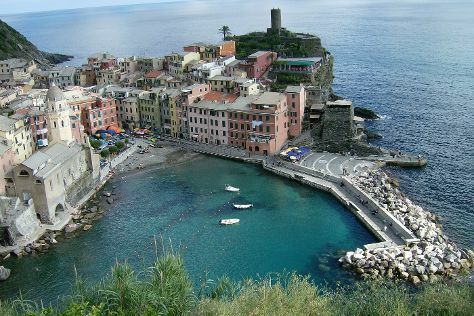 Liguria's coastline is dotted with dozens of sandy, rocky, and pebbly beaches. Genoa, a thriving urban center and the country's largest commercial port, is also here. An easily accessible holiday destination, the region features an excellent network of roads and railroad lines that run the length of the coast, linking the popular Italian Riviera with France and the rest of Europe, which makes it especially convenient if you’re planning trips to other areas. Whether you choose to travel by train or car, the journey takes you through tunnel after tunnel and past villages, vineyards, and olive groves. Liguria is in Italy. Find what you're looking for from your Liguria holiday, by planning the whole thing with us using our handy Italy trip itinerary planner .